Have you ever been transfixed by the breathtaking sight of a peaceful Koi in a pond? These colorful beauties fetch a hefty price on the market, but if you're thinking of getting a tattoo of a Koi, do you know what the image of this animal totem means? The Koi is actually a carp, in fact, the Japanese name for the fish is 'nishikigoi', which translates to 'colored carp'. Although the fish has become the quintessential symbol of the Japanese culture, it actually gained its regal status on the shores of the Yellow River in China long ago. The Koi is said to have conquered the impossible by swimming against the current of a massive waterfall known as the Dragon Gate. This legend spread on the lips of Chinese traders and sailors, eventually finding its way to the islands of Japan. More than a thousand years ago, Prussian Carp was originally domesticated and selectively bred in China to create the delicate beauties that we now know. Although the exact date when Koi was introduced to Japan is unknown, records show that Koi breeding on the tiny island of Honshu date back to as early as the 1800s. By the 1900s, Japan was completely engulfed in a Koi craze that would eventually spread to the outside world on the wings of war. With the advent of WWI, Japan slowly began to open its borders and the world became aware of the Japanese love affair with the delicate Koi fish. The traditional Japanese art of tattooing known as Irezumi is practiced by seasoned masters who spend countless years perfecting their craft. Irezumi tattoos are intricate designs that are almost always done without the use of electric needles or pre-mixed ink. Earning a Irezumi piece takes a level of determination and persistence, since doing such intricately detailed pieces using old school techniques is not for the faint of heart. These pieces of art are usually worn by members of the Japanese criminal underbelly and often feature brightly colored Koi fish. The fish is considered to be a totem of bravery, Nobility, Ambition, Loyalty, and strength of character, all of which are traits that criminals hold dear. Irezumi tattoos with a Koi motif were thought to be badges of honor and the only men who proved themselves worthy of wearing these designs were those who had shown no fear in the face of certain danger. The fish has also come to symbolize many other desirable human traits. Its name 'koi' in a homophone for the Japanese word for 'affection' or 'love', as such, giving a Koi to a loved one is a sign of affection. They are also emblems of Success, Luck, Prosperity, and Ambition, and this is why many businesses have beautiful Koi ponds at the entrance of the establishment. The principles of Feng Shui dictate that the direction that a Koi swims strongly influences your future wealth and prosperity. A Koi that swims against the current (upstream) brings good luck to the owners. Yu don't have to be a devout fan of Japanese culture to appreciate the symbolism of a Koi Tattoo; you only need to be a lover of beautiful art. Koi Fish Tattoos come in a variety of colors, but did you know that each color has a specific meaning. filling your pond with fish that have gold, silver, or platinum hues are believed to bring wealth and prosperity to your home. The Ogon Koi and the Yamabuki Koi, known for their beautiful metallic hues, are popular varieties seen swimming around the ponds and aquariums of businesses worldwide. Since the Koi is a symbolic of Love and Family, their colors can be used to represent certain family members. Koi Fish with white and/or blue colors are represent a son, whereas pink signifies the presence of a daughter. A fish with a vibrant red color symbolizes a loving mother and the love and affection that she offers to her family. Red Koi also represents Bravery and Power. A black Koi is a sign of a strong father, Success, and Transformation. In many cases, artists add other elements to the tattoos to give the design a particular meaning. The legend of the Dragon Gate is alive and well in the Asian culture, as such, many Koi tattoos feature both the dragon and the Koi fish. Dragon Koi Tattoos represent Transformation, Rebirth, and success after overcoming almost insurmountable obstacles. It symbolizes your desire to start anew and find balance and harmony using the Yin Yang philosophy. A Dragon is creature of Fire and Power, whereas a Koi is an element of Tranquility. A Koi and a Dragon locked in an eternal dance shows your desire to find harmony between these two seemingly opposite forces. Members of indigenous tribes have long held true to the believe that decorating their bodies with the image of a sacred animal totem is a way of drawing the animal's power and spiritual energy into their bodies. Many tribes do this by using their own unique series of marks and patterns that have a particular cultural and spiritual significance. Placing a Tribal Koi Tattoo into your artwork is a way to associate with a particular region and imparts the noble characteristics of Tranquility, Love, Friendship, and Prosperity that the Koi embodies. Both the colorful Koi and the delicate Lotus flower are embodiments of Purity, Feminine Elegance, and Perseverance. The breathtakingly beautiful Lotus grows out of a horrendous environment and the persistent Koi never shies away from completing its uphill battle against a powerful waterfall. In China, cherry blossoms signify Hope, Femininity, and Fertility, but the sweet Cherry Blossom also carries with it a somewhat sinister meaning. In Japan, WWII kamikaze pilots painted these delicate beauties on the sides of their planes before going on suicide missions. Cherry Blossoms represent our mortality and the glory of an honorable death. A fallen cherry blossom is symbolic of a brave soldier or Samurai who has passed in the line of duty. Koi and Cherry Blossom Tattoos are most popular in the Japanese culture to signify not only Purity, Perseverance, and Bravery in the face of adversity, but also the essence of Femininity. The duality of human nature is expressed with a Yin Yang Koi Fish Tattoo. It shows your desire to achieve harmony and balance between the seemingly opposite, yet complementary sides of your personality - your rational, tranquil nature and your powerful, passionate side. Yin Yang Koi Tattoos can feature Dragon and Koi, Phoenix and Koi, or two Koi circling each other in the delicate dance of Life. In these designs, the Dragon and the Phoenix represent your passionate, fiery nature, while the Koi is your calm, logical side. When your body art has two Koi fish, it is the color of the Koi that is of greatest importance. Black or blue represents your powerful, masculine nature, while hues of red, pink, or orange are reserved for your delicate, feminine side. 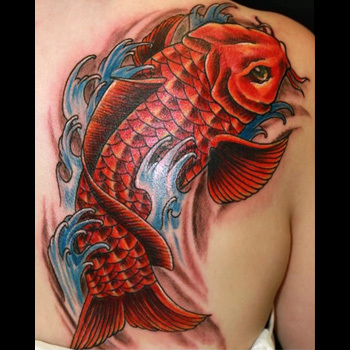 What better way to represent your Zodiac sign than with a tattoo of a beautiful Koi? Persons who are ruled by the natural element Water and the planet Neptune are known for their willingness to embrace change and their ability to go with the flow in the name of seeking better fortunes. Koi are also highly adaptable, ambitious, and will never quit in the face of adversity, as such, a Koi Tattoo a perfect fit for any Piscean. Regardless of which variation you choose, Koi Tattoos are great ways to show off your can do attitude and resilient spirit. You can incorporate any element into your design and create a tattoo that speaks to your personality; the only limit is your imagination. For inspiration, then visit our design page at www.itattoodesigns.com and let our team of artisans create a truly unique piece exclusively for you.